Meat rabbit breeds for backyard homesteaders – the top 10 and one you really should avoid. 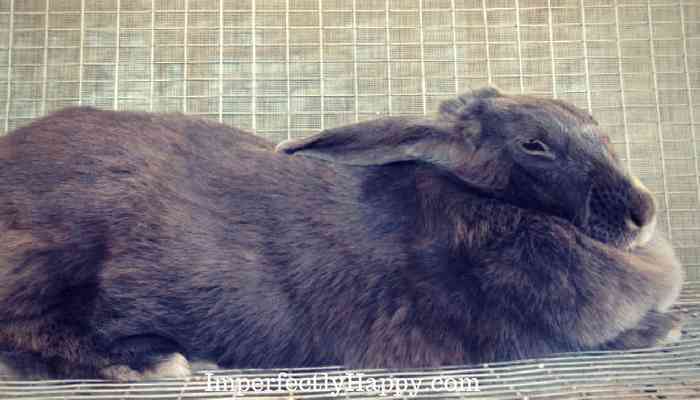 Today I bring you the top 10 meat rabbits for backyard livestock. I am not listing these in any particular order other than the first 3 which we have raised ourselves. Each of these meat rabbits have their own qualities that make it more desirable. Feel free to leave your choice in the comments. When you consider your meat rabbit breeds, it may be best to pick one you don’t find outwardly appealing; if that is going to make harvesting more difficult. I know many backyard homesteaders that will only raise white New Zealands for this reason alone. It is something to consider because death is part of raising a meat source on your homestead. The New Zealand could easily be called the most popular of all meat rabbit breeds. The breed has been around since the early 1900s and has been primarily raised as a meat and fur rabbit from the beginning. They put on weight quickly with a good meat to bone ratio. The full grown doe will be about 9-12 lbs while the buck will be 8-10 lbs. We started with this breed breed in white because our initial research made this rabbit seem ideal for backyard homesteaders. However, I found the does to be pretty aggressive and I actually never got our first doe to kindle (have a litter) even after several breeding attempts. Another very popular meat breed is the Californian. The Cali was originally created by crossing the New Zealand with a Chinchilla and Himalayan. The Cali has a white body with black points on the ears, nose and feet. Also a dual purpose meat and fur rabbit the Californian runs a bit smaller than the New Zealand at 8-10 lbs. Our Californian doe was a personal favorite of my youngest daughter because of her gentle disposition. Calis are great moms too! I prefer a New Zealand buck to a Cali doe for optimal meat production – fast growing and large hind end. This is the breed that we are currently raising. This is classified as a “heritage breed” and still on the critical list. The American comes in two colors, blue and white; we raise the blue variety. The American is a large dual purpose rabbit that can reach 10-12 lbs as an adult with a lovely mandolin body shape. I have found these rabbits to be some of the most gentle we’ve come across. They’ve been the easiest to breed, with good sized litters. My does are typically wonderful mothers who don’t mind me poking in for a head count, even shortly after birth. The Champagne D Argent is one of the oldest recorded rabbit breeds, with a history back to the 17th century. The beautiful rabbit has been raised for both fur and meat with a good meat to bone ration. According to their club this breed is also known as the “Black Angus” of rabbit meats. Generally docile and good mothers this could be a great starter rabbit or one to consider adding to your current rabbitry. Developed in the 1960s the Florida White is referred to as an “all” purpose breed. This breed is quite a bit smaller than most traditional meat rabbit lines; but that size can work in your favor. For those raising for meat for only 1 or 2 people or with very limited space, this little rabbit can offer a lot. The adult FL White will get between 6 and 8 lbs with a light bone structure that offers an awesome dress out weight. Their temperament is normally relaxed and great for beginning rabbit raisers, especially if younger children want to be involved. I’d say they are a power packed rabbit! The Silver Fox is actually considered a “fancy breed” with dual or all purpose qualities for meat, fur and pet. It has been part of the ARBA since 1925 but is currently considered a rare breed. A large rabbit, with adult rabbits weighing around 10 – 12 lbs. According to the Livestock Conservancy is has one of the highest dress-out weights at nearly 65%. The Silver Fox is a gentle giant that will enjoy attention and are easy to handle for breeding. This breed has a threatened status and could be a good breed to consider raising for show and sale as well. 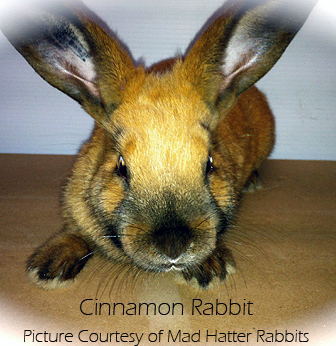 ticking, the Cinnamon is an impressive rabbit. The Cinnamon is another breed that has been used as pet as was as for meat and fur; meat was the original intent for this breed. This is a large breed that reaches weights between 8.5 and 11 lbs. The breed is known to be gentle with good mothers and litter size. The only downside to the Cinnamon is that they can be difficult to find. The American variety was developed from the European Chinchillas which were quite smaller than their newer American cousins. Originally sought after for their beautiful fur the American Chinchilla is now considered a dual purpose rabbit for both meat and fur. American Chinchilla are an excellent meat rabbit with a deep loin and broad shoulder; with 12 lbs adults being quite common. They are currently still listed as endangered list and if you decided to raise this breed you may want to consider showing and selling. 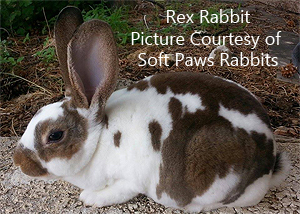 The velvety fur of the Rex rabbit has made it a popular fur rabbit. I like this rabbit because you get a good meat producer with fur and pet qualities as well. The breed comes in a wide variety of colors with adult weights closer to the Florida White, at 8 – 9 lbs. Again, great for a smaller producer and someone that wants a pretty rabbit to raise. This beautiful rabbit was one of the first that we looked at raising a few years ago. At the time finding Palominos in AZ was difficult but that seems to be changing. With smaller bone you’re going to get a good meat ratio from your grow outs, through you may find them a bit slower than some other commercial breeds. They have good sized litters and excellent temperaments as well. If you can find this awesome breed in your area it would be a wonderful producer and addition to your homestead. Why no Flemish Giant? The Meat Rabbit to Avoid. 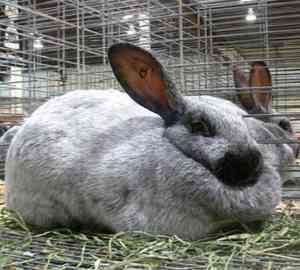 The Flemish Giant is a great rabbit and they are truly GIANT with rabbits reaching up to 20 lbs. They slow growers who also require a lot more food. They are also large boned making their meat to bone ratio low. I have heard that Flemish crosses make a better choice if you want to use them in your homestead meat production. Consider a Flemish doe and a New Zealand or Californian buck. This are certainly not the only breeds that you’ll hear about or even want to consider. Some homesteaders consider “meat mutts” a preferable rabbit for meat production. Access your needs and start doing some research into these breeds to see if they meet them. Remember that quality breeding cannot be overlooked and a cheap rabbit on Craigslist may give you exactly what you paid for. Spend some time with reputable breeders that know genetics, keep records and keep a clean rabbitry. Put the money and time into your breed stock – it will pay off in spades. This is my list of the top 10 meat rabbits but it certainly isn’t an exhaustive list. What meat rabbits would you add to the list? I have been looking for American Blues for a while now! Do you ever sell pairs? That’s a serious bummer. There are no listings on that site. I’ve done everything but go to a show to find these rabbits, and no luck. Thank you for replying. Have you found any American blues? I raise Champagne D’ Argents but know several that raise Americans. Where are you lacated? I have found them in Phoenix. Have you tried their club page for breeders? I am in California in the mountain above Bakersfield. Looking to raise American blue and whites. I am not sure your altitude but I am at 6000. Do your rabbits do well where you are and if you believe they are a good match for my area and colder California climate. My chickens do well no heat. Thanks for this info! I have a Flemish Giant doe that I got for free from a work colleague who was moving and couldn’t take her with him. I’ve been considering breeding her for meat and was wondering about cross breeds. I’m brand new to rabbits and this post was just what I needed for a jumping point. Generally I don’t recommend the Flemish as meat rabbits. But I think crossing that doe with a smaller, faster growing, buck could have some great results. We breed Flemish does to new Zealand or rex buck and get nice growth and good meat to bone. Hi! We live in Titusville Florida, Space Coast, and am considering raising rabbits. Right now I am collecting information and reading literature. But, I would like a duel purpose breed. What breeds do well in the Central Florida heat and don’t require air conditioning. Do the fur rabbits require air conditioning for a luxuriant coat? Yes, they’ll never develop a thick coat in hot / humid conditions. We have the same issues here in Arizona. Sorry to see you did not mention Dutch or Butch. These are very low bone to meat ratio. With colorful pelts. Some of the black pelts are very high dollar. Average litter 9-12. Does are protective thou. Also I find the meat tastier then the NZ and Ca. Are you still breeding Americans? I would be interested in getting a breeding pair from you, if that is possible. I’m not selling rabbits right now.